Published: Sept. 14, 2010 at 10:56 a.m.
NFL.com offers up 10 players to target off the waiver wire to improve your fantasy football team. The number listed in parenthesis is the percentage of NFL.com leagues that the player is still listed as a free agent. Michael Vick, QB, Eagles (94.8 percent): Kevin Kolb suffered a concussion against the Packers in Week 1, which opened the door for Vick to showcase his own skills and abilities. He thrived in Kolb's absence, scoring the third-most fantasy points (21.30) among quarterbacks. 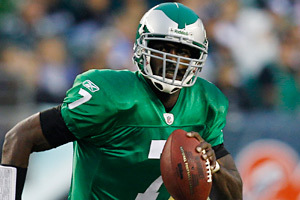 With Kolb now likely to miss at least one contest, Vick is suddenly a very viable fantasy starter. He also has an incredibly favorable matchup against the Lions in Week 2. Peyton Hillis, RB, Browns (99.0 percent): Hillis started ahead of Jerome Harrison in Week 1 and outscored his teammate in fantasy points. While this looks like a committee situation, Hillis appears to have earned enough of a role in the offense to warrant fantasy consideration. Not only will he share carries with Harrison, but Hillis is also the favored goal-line option for coach Eric Mangini. He also has a good matchup agianst the Chiefs ahead. Brandon Jackson, RB, Packers (99.1 percent): Jackson is destined to be one of the hottest waiver-wire adds in fantasy football this week. With Ryan Grant (ankle) out for the season, Jackson is in line to take over a featured role in one of the league's most prolific offenses. He also has a great matchup next on the schedule, facing a vulnerable Bills defense. If you're lucky enough to add Jackson off waivers, he'll be a viable No. 2 fantasy back in Week 2. Austin Collie, WR, Colts (36.5 percent): Here's a quick quiz - which Colts wide receiver scored the most fantasy points in Week 1? No, it wasn't Reggie Wayne or Pierre Garcon, it was Collie. He blew up for 131 yards and one touchdown in a loss to the Texans and is clearly ahead of Anthony Gonzalez on the Colts depth chart. While he won't put up such huge numbers every week, Collie is too good to be a free agent in close to 50 percent of leagues. Eddie Royal, WR, Broncos (40.3 percent): Remember when Royal was a rookie standout, catching an amazing 91 passes? Well, he looked a lot like that receiver (and less like the one that had just 37 catches in 2009) in Week 1 against the Jaguars. The Virginia Tech product caught eight passes for 98 yards and saw 10 targets in the contest while spending most of his time in the slot. Royal should now be added in all leagues, espcially those PPR formats. Mark Clayton, WR, Rams (98.3 percent): So much for needing time to acclimated with his new team! Clayton, who was traded to the Rams late in the preseason, posted an impressive 10 catches for 119 yards in a loss to the Cardinals. Amazingly, he was targeted 16 times in the contest - only Roddy White saw more targets among wideouts in Week 1. Clayton, a one-time fantasy sleeper with the Ravens, is now worth a look in leagues with 12-plus teams. Legedu Naanee, WR, Chargers (93.6 percent) Malcom Floyd was the big sleeper in fantasy circles for the Chargers, especially with Vincent Jackson out of action. But it was Naanee who put up more fantasy points (17.0) in Week 1, posting 110 yards and one touchdown. Granted, his score came on a blown coverage in the third quarter and was a big chunk of his yardage. Still, Naanee is a viable fantasy option, especially with a matchup against the Jaguars next up. Mike Williams, WR, Buccaneers (89.1 percent): Williams, a talented rookie out of Syracuse, showed that his solid play in the preseason was no fluke. In his regular-season debut, he caught five passes for 30 yards and scored a touchdown in a win over the Browns. Williams would have scored a second touchdown, but Josh Freeman overthrew him when he was wide open. Williams should be owned as a fourth or fifth wideout in most leagues with 12-plus teams. Mike Williams, WR, Seahawks (93.4 percent): I'm not about to anoint Williams a must-add wideout - I'd much rather have his namesake from Tampa Bay - but he's clearly earned a more prominent role in the Seahawks pass attack. In Week 1, he led the team in receptions (4) and yards (64) and was targeted six times by Matt Hasselbeck. If you need a reserve wide receiver in a larger league, both Williams and his teammate, Deion Branch, are worth a look. Zach Miller, TE, Raiders (24.6 percent): Miller might not have had a spectacular stat line for owners in standard leagues, catching four passes for 43 yards in a loss to the Titans. But he was targeted eight times by Jason Campbell - that made him the fourth-most targeted player at his position in Week 1. He has the tools to be a nice fantasy starter in leagues with 10-plus teams, so add him if you need a tight end before it's too late. 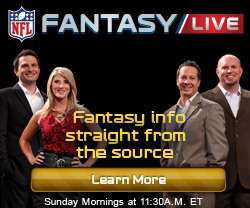 Michael Fabiano is an award-winning fantasy football analyst on NFL.com. Have a burning question for Michael on anything fantasy football related? Leave it in our comments section or send it to AskFabiano@nfl.com!